One of the major freeways interconnecting Australia’s urban centres, and commonly known as the M1 Freeway, the Monash Freeway is amongst the busiest in Victoria. By connecting Melbourne’s CBD to the southeast regions of Victoria (by joining with the Princess Freeway), it is easy to see why the Monash Freeway is used by millions of travellers each year. Given the sheer volume of vehicular traffic on the Monash Freeway, one of the most ubiquitous traits of the Freeway is the characteristic slow traffic during rush hour for those heading into the CBD. For this reason, travellers are advised to schedule their trips during non-peak hours. Travellers should note that the Monash Freeway has a toll system as part of EastLink which connects the Eastern, Monash, Frankston and Peninsula Link freeways. If travelling out of the city on the Monash Freeway, travellers are required to purchase a toll pass. Motorists who don’t have an account with EastLink will need to buy a trip pass, which provides access to EastLink for a single trip in one direction. Each trip pass costs $5.94 for a car. It is advisable to buy the pass a couple of days prior to travel in order to ensure seamless travel. However, if you accidentally drive on one of tollways without a pass, you have 24 hours to purchase a pass in order to avoid a fine. All payments can be made using a credit card online, or select petrol stations can accept cash as they have machines where you can purchase a toll voucher. All you need to purchase a toll ticket is the date of travel, where you intend to travel to, and the registration and type of vehicle. is there a connection from the m3 to the m1? What exit from m3 to get to m1? There is, in fact, a connection from the m3 onto the M1. There doesn’t appear to be any exit numbers used along Eastlink, so what you are looking for is the “Monash Fwy” signage. This is after the Wellington Rd exit if you are travelling south or after the Princes Hwy exit if you are heading north (that one is combined with the Police Road exit). I am not sure which direction you are travelling, but it appears that if you are heading south, you can get on to the M1 to go towards the city or go towards Warragul, whilst if you are travelling north, your only option is to go towards the city (unless you get off at Police Rd to get back on the freeway again to go towards Warragul). Hope this helps. There is a lot of details above but just look out for the signs with “Monash Fwy” on them. 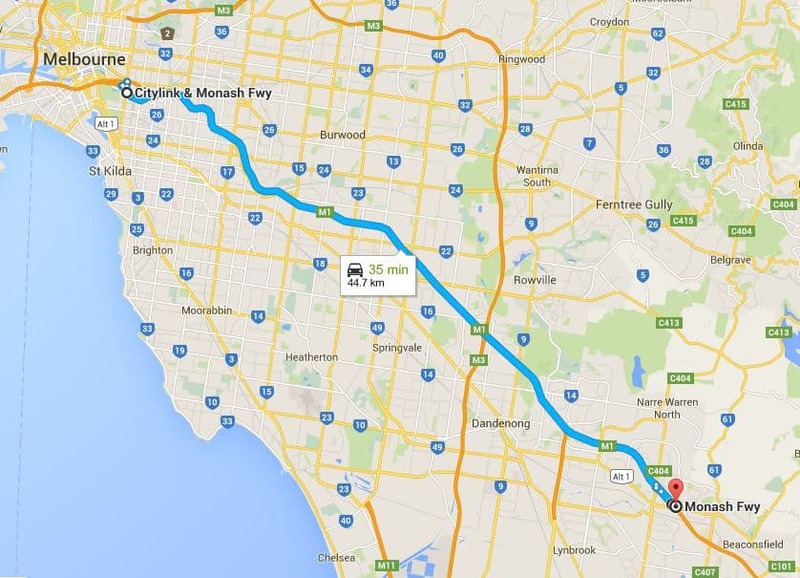 Hi, what is the first entry ramp onto the East Link/Monash Freeway heading south from Melb CBD to Pakenham please? I only want to use a Trip Pass for a return trip to Pakenham on Fri 14/9/18 and don’t want to go on City Link. Thanks.. If you heading towards Pakenham and want to avoid Citilink, the first entry ramp outside of the toll zone would be Toorak Road. This is also the case on your return trip, where Toorak is the last exit before encountering tolls. I was traveling to the city this Sunday night and supposed to take Toorak road exit. But because of road works that was closed and I had to enter into toll zone. What does happen in this case? Do I have to pay? Unfortunately, it does look like you will need to pay the toll – regardless of how little notice that there may have been on their end (I am not in Melbourne right now, so i dont know if there was updates on the TV, Radio, Online or what the signage was like prior to the exit). “The Toorak Road inbound exit ramp from the Monash Freeway will be closed this weekend from 10:00 tonight until 5am Monday, for noise wall works. Tolls are payable should motorists choose to exit at Yarra Boulevard, which is the next exit. I am not sure if you have a Citylink or Eastlink account, but if you have, you will just get billed as per normal. If you don’t, i would suggest buying a pass asap, as you will likely incur some kind of late/administration fee if you don’t buy one today (i checked the payment system and today is the last day you are able to buy a pass for Sunday night). Best to put your trip into the Toll Calculator here which will give you an accurate assessment of any tolls. You can use the toll calculator here on the Citylink website to work out any tolls you pay on any given journey. Hi, My name is John just want to ask a question about pay pass. If I travel on the M1 from Warragul to tynong do i need to buy the pass? No pass is required beyond Malvern. So you don’t need a pass for your trip. Yesterday I ended up in the Burnley tunnel and travelled to Dandenong on the Monash freeway. I have already purchased a city link pass as I went to the Airport. Do I need another pass for the Monash. Check which pass you purchased, some of them are only valid for one day (or 24 hours from time of purchase). If you have only purchased a 24 hour pass, you may need to purchase another if you intend to travel outside this period. No you wont have to pay a toll. The tolls towards the city commence after Burke Road, so as long as you exit at Burke Road, there will be no toll. Here is an online toll calculator and map for your future reference.